I think Housemarque is trying to kill me. “I should go to sleep,” I say, as I slump into my chair and turn from the monitor, spent. “But my music is so good.” It’s Nex Machina, calling me. “Yeah, but I’ve got to drive and, like, not crash my car, so…” I rebut, my point weak, my palms sweaty. “But these controls, you can feel how smooth they are, how elegant,” they beckon, and I know. I know I’m doomed to lose the night to Nex Machina. I normally don’t spring for a twin-stick shooter. Call me what you will, but they’re a little too fast, a little too tough, and just a little too one-trick-pony to hook me in. So what was different about this title? It was the look; some ineffable quality about that eighties inspired, neon-techno, grunge-punk aesthetic just spoke to me from the screenshots, and I figured I’d give it a go. Nex Machina begins simply, with just a few options on the main menu. You’ll notice controller button icons around the screen, here and there, indicating what to press to get where (which can occasionally give away a shoddy port job in advance), but a few points quickly become apparent: first, this title was absolutely made with the actual twin-sticks of a controller in mind; second, despite this first point, the title does provide mouse and keyboard support; and finally, said mouse support is somewhat rough. During a playthrough with the mouse and keyboard setup, I noticed that, while the mouse control itself seems just as responsive and snappy as the controller (or better), the game-window didn’t seem able to lock the mouse to it. This resulted in the occasional wild click registering as outside the window somewhere on my second monitor, minimizing the whole application — which wouldn’t be so bad, if those wild clicks weren’t usually a response to some of the dicier moments. But they were, and as far as I could tell, there was no auto-pause feature upon defocus. I lost some pretty good runs that way. The mouse also doesn’t have a crosshair, and while I can understand this design choice for a controller, a mouse can’t be tilted in the direction you want to aim. I spent a good amount of time on my mouse-and-keyboard run just trying to figure out where I would be shooting. Now, saying all this, you do get the Windows cursor to help as a kind of makeshift crosshair, but given its default color, it can be very easy to lose it in the more chaotic bursts of flashing colors. It sounds minor, but in a title as fast-paced and demanding as Nex Machina, that little bit of disorientation can be the difference between a new high score and game over [EN: Every frame matters]. Now, if it seems like I’m hammering these mouse control issues somewhat harshly, it’s because I actually didn’t run into another issue of the like. The combat, the sound, the visuals — everything else is on point, but this one bizarre issue with the mouse just makes it all an effort in frustration. And it stays a frustration, right up to the point where you plug in a controller. On a controller, Nex Machina comes to life with smooth, responsive movement and shooting that avoids any worries that the controls will do you in. Instead, you become free to experience it without interruption, and what an experience it is. 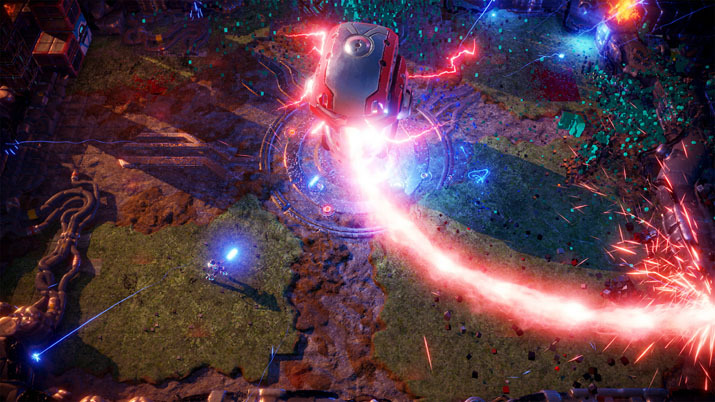 The steam page and trailers make a point of emphasizing what a throwback Nex Machina is to the old, arcade twin-sticks of yesteryear, and that presence is certainly felt as you blast through wave after wave of robotic foes, rescue hapless civilians, and pick up various power-ups to aid you in filling your combo meter and getting the high score. This gameplay itself holds to that old adage so popular among arcades of, “simple to learn, hard to master.” And there really isn’t a lot to Nex Machina, mechanically. You can get a few power-ups that change the way your dash works, and your alternate weapon can be changed almost at will, but the experience is all just move, shoot, and don’t get shot. There’s also some incentive to explore the voxel terrain (by shooting it, as one does), in order to unlock secret humans that improve your score multiplier, or to unearth the entrance to a secret level, where you can test your skills and boost your score in an even more inhospitable environment. I say even more because, while it starts easily enough, each world and level ramps up its difficulty exponentially through both Arcade and Arena modes. Arcade mode can be thought of a bit like the campaign, in that you play it through and advance from world to world to win, whereas Arena mode is just one of the worlds from arcade, with no progress to the next world afterward, but an opportunity to earn in-game cosmetics coins and rank on the leaderboards. There’s also a local co-op multiplayer mode that runs on shared-screen functionality instead of split screen, though I didn’t get to try that out since I lack the fundamental first requirement to do so: friends that live near me [EN: Aww]. Still, what I lack in available friends, Nex Machina makes up for in style. The whole of the title is awash with the “Cablepunk” retro stylings of voxel machinery and has enough neon lighting to power a small nation. What’s more, I was actually pleasantly surprised to find that the voxels weren’t too overblown; the whole game is littered with them — notably, enemies disintegrate into voxel clouds when you kill them — but they’re used as something of an accent, while plenty of enemies and effects are either regular 3D models or special effects. Add this all up and factor in the regular splashes of neon and pastels and you have a combined aesthetic that joins with the synth-heavy soundtrack to really capture that late ’80s vibe. Not all efforts in nostalgia end in success, of course, but with Nex Machina, Housemarque has crafted a fast and fun twin stick-shooter with crisp visuals and challenging gameplay. Flawed only by a problematic mouse adaptation, they’ve created a solid execution of a gaming staple that I can already tell is going to ruin my life with long nights spent guns ablaze and soundtrack pumped instead of drifting into sleep. Since that naturally can’t be my fault, I have only them to blame for the quality of this release. 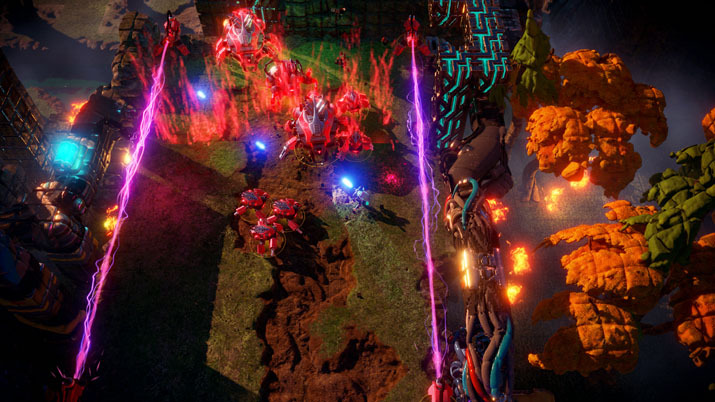 Twin-stick fans and arcade junkies, Nex Machina is calling. Will you answer?